The county government should work effectively and openly with all city governments. Our County Commission and local boards and authorities need to be transparent and accountable to the people who pay for them. That includes agendas, minutes, and agenda packets online. For years I have videoed local government meetings and put them on YouTube for everyone to see. It’s time for our county government to do that itself for its own citizens. The county government should be a good steward of taxpayer funded resources. Suing a local business is not a good way to keep or attract business. Gretchen stood up for Lowndes County taxpayers against an unnecessary lawsuit against local business Deep South Sanitation. Standing up for property rights includes opposing an unnecessary pipeline and being smart about development. No private company should be able to come in here and take people’s land for no local benefit. 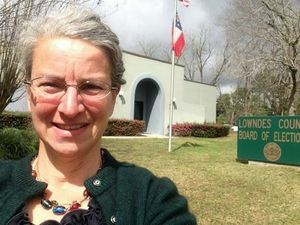 Gretchen stood up for Lowndes County against the Sabal Trail methane pipeline. Our community has a foundation in agriculture and we need farmers and farmland just as we need roads and subdivisions. Stewardship is an important part of economic development. Local government needs to remember its purpose is to provide services for its people, unlike a business, which is for profit. I will never suggest charging for a library card. The county government should welcome and provide opportunities for citizen input. I’m for fast, affordable Internet access to promote the local economy and education, for solar power for jobs and lower electricity bills, and for making Lowndes County even more of a health care destination. I have actively promoted local agriculture by volunteering at the County Extension office, selling vegetables at the Valdosta Farm Days Farmer’s Market and I recently chaired the South Georgia Growing Local conference in January. Local food: it’s local business and it tastes good!